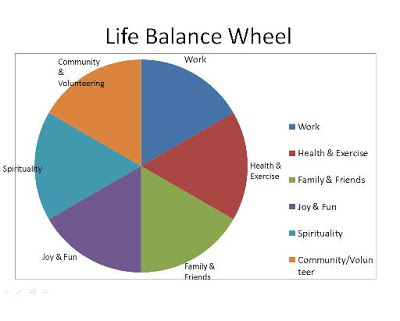 Since today’s key word is “Balance”, I thought I would include a Life Balance Wheel that I use in my workshops for helping to live the life of your dreams. This is a Balance Wheel that helps to clearly identify which areas in your life are out of balance. 9 years ago, I saw this in an article in a magazine called “Dare to Dream” on keeping New Year’s Resolutions. It talked about getting a goal group together and limit to about 6 people max and identifying areas of your life that you wanted to focus on. The recommendation is to do six areas and divide into six equal sections and give the following labels: work, health and exercise, community/volunteer involvement, spirituality, family and friends and joy and fun. One lady had it with all the volunteering she was doing, so totally dropped it out of her circle. I actually separated family and friends into 2 different sections as well as adding home projects. You could also add financial or any number of additional labels. Once you have decided on what are important to you, label the circle, and place a dot in each section marking the degree to which you feel satisfied in that particular area. A dot near the outer rim means you feel satisfied very satisfied, one placed near the center, not so satisfied. Now connect the dots and take a look. Certain areas of your life may stand out as lacking because you spend little or no time at them. When I first did this, I was shocked at how out of balance my life was. It was literally all work! To get a visual of this was very helpful for me. Have you used anything like this in your life? How have you found it has worked for you? Any great extra tips? Would love to hear from you. Here’s to living a balanced life.